Thanks to the release of the Captain Marvel trailer, we've been given a much closer look at the upcoming film, which comes out March 8, 2019. For digital publishers, this means new access to movie screengrabs (ah-thank you). But for some, it meant material to troll Captain Marvel actress Brie Larson — a decision which, I'm sure, they now regret. If you're not yet familiar with Captain Marvel, know this: She's the strongest superhero in the entire Marvel Cinematic Universe. Those are words right out of Marvel Studios President Kevin Fiege's mouth in an interview with Vulture, so, don't bother fighting me on it. Based on the trailer alone, it's fair to assume that Captain Marvel is going to face a ton of adversity in this film. From crash-landing in a Blockbuster to losing her memory to fighting an alien war, Captain Marvel has a long road of hardship ahead of her. Understandably, CM doesn't do a whole lot of smiling in the movie's trailer. Of course, this isn't unlike most MCU superheroes. 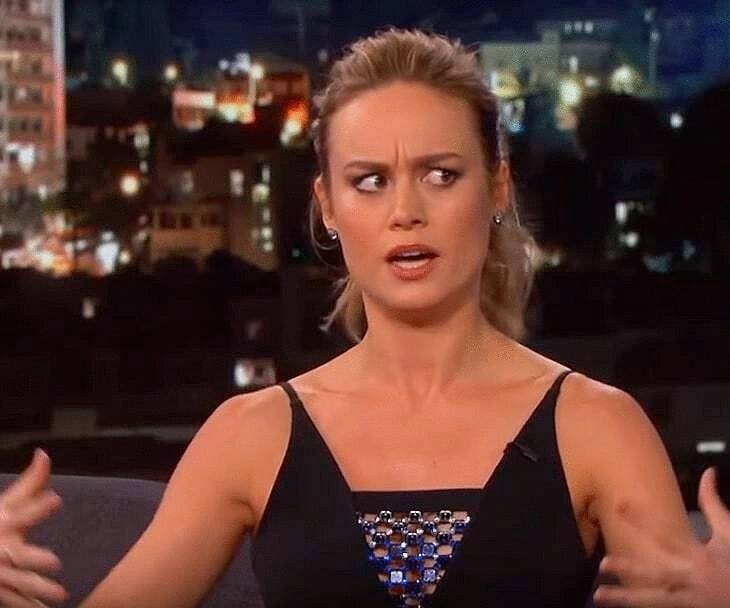 But for some reason, one Twitter user decided to photoshop a smile on a bunch of Captain Marvel images. Now, I should also mention that Captain Marvel is the MCU's first-ever female led film. Hmm, isn't it interesting that the first time someone decides a MCU superhero needs to smile, it's the first female lead? Now, I do believe in coincidences. But this, folks, is not one. These edits call attention to the very common issue surrounding women being told (verbally or by way of photoshop) that they should "smile more." Put simply, insisting that a woman should "smile more" implies that her emotions or physical appearance are solely for your pleasure, which is altogether objectifying her. Think about it: How often are men told that they should smile more? Capitalizing on that point, Brie Larson posted several photoshopped images of male superheroes with their expressions changed to smiles on her Instagram story. I can't think of one scene where the sorcerer smiled in Doctor Strange or Avengers: Infinity War. And yet, no one tried "fixing" him — aside from now, and only to prove that exact point. Larson also Instagrammed a smile-edited photo of Captain America who, despite having perfect teeth, doesn't smile in any promotional content either. Moving on to Iron Man, you can truly to see how ridiculous this whole "superheroes should smile" concept is in general. With that in mind, it's easier to see how Captain Marvel's "fixed" smile has something to do with her gender, as it's the only thing that separates her from these other MCU leads. And like I mentioned earlier, Captain Marvel has a lot on her plate. An unconfirmed plot leak might give you more insight. Larson also posted this Instagram story, encouraging her fans to trust in who they are and straight-up ignore the haters. Evidently, Larson is both an on-screen and real-life role model. Suffice to say, you can't bring Brie down. We're talking about the woman who was cast as Captain freakin' Marvel, remember? That experience alone has given her strength. Speaking to Entertainment Weekly about her role, Larson said, "The response was really positive, and that felt really cool." She added, "I mean, making movies is hard, and making films of that size is even harder." "It requires so much physically, and it's a lot longer shoot, and there's also the pressure because this is a character that is incredibly inspiring to people and means a lot," said Larson. "So you just want to get it right. I feel really excited about how everything is shaping up," the actress explained. Like I said, Brie Larson: You can't hold her down.